This assessment contains 35 questions. You should read each one carefully and select the answer that best describes your response to that particular question. 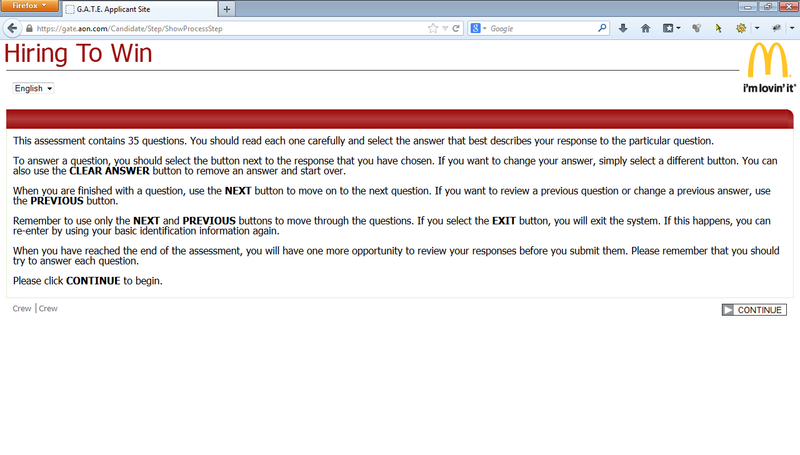 To answer a question, you should select the button next to the response that you have chosen. If you want to change your answer, simply select a different button. You can also use the CLEAR ANSWER button to remove an answer and start over. When you are finished with a question, use the NEXT button to move on to the next question. If you want to review a previous question or change a previous answer, use the PREVIOUS button. Remember to use only the NEXT and PREVIOUS buttons to move through the questions. If you select the EXIT button, you will exit the system. If this happens, you can re-enter by using your basic identification information again. When you have reached the end of the assessment, you will have one more opportunity to review your responses before you submit them. Please remember that you should try to answer each question. Please click CONTINUE to begin.